So when I asked him what cake he wanted for his birthday, he said 'I don't want cake', so I went away and thought about it and came up with this. I had seen it before and in all honestly thought, just let kids eat cake for their birthdays, I thought people were just being over the top 'healthy', but now I realised maybe they aren't, for in my situation I made it because my son doesn't like cake. 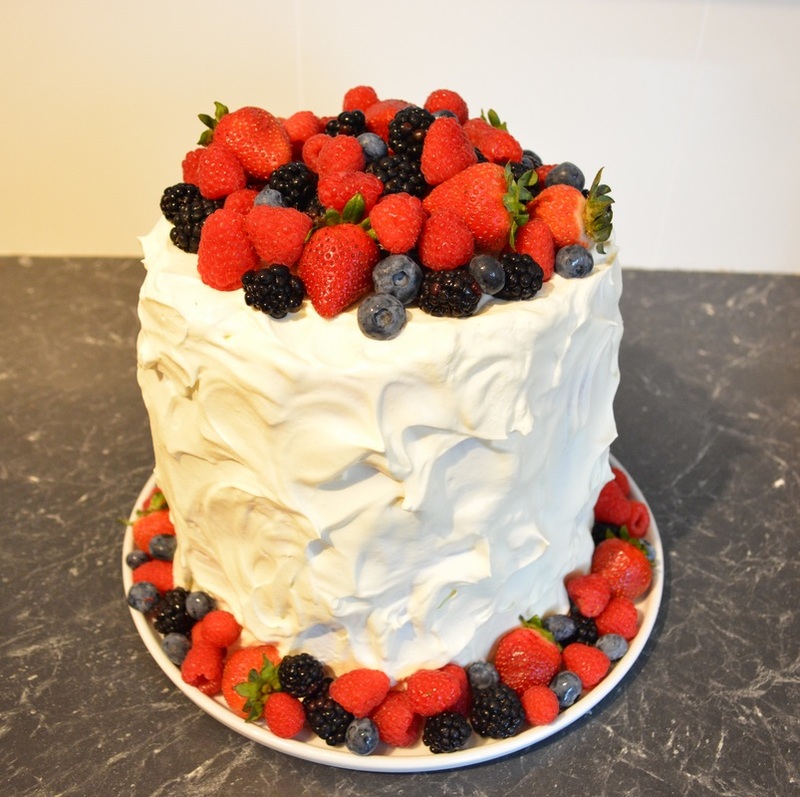 Anyway it was brilliant, my son was so excited, it looked beautiful as I had decorated it with his favourite berries. He told me not to tell anyone as he wanted to surprise his cousins with his cake. It was quite funny as I took a photo of him slicing his cake and I have all these kids staring at the cake, wondering what it was made out of. This 'cake' was made quite big as my son wanted it big, however you make it whatever size you like, it would look great even if it was smaller. 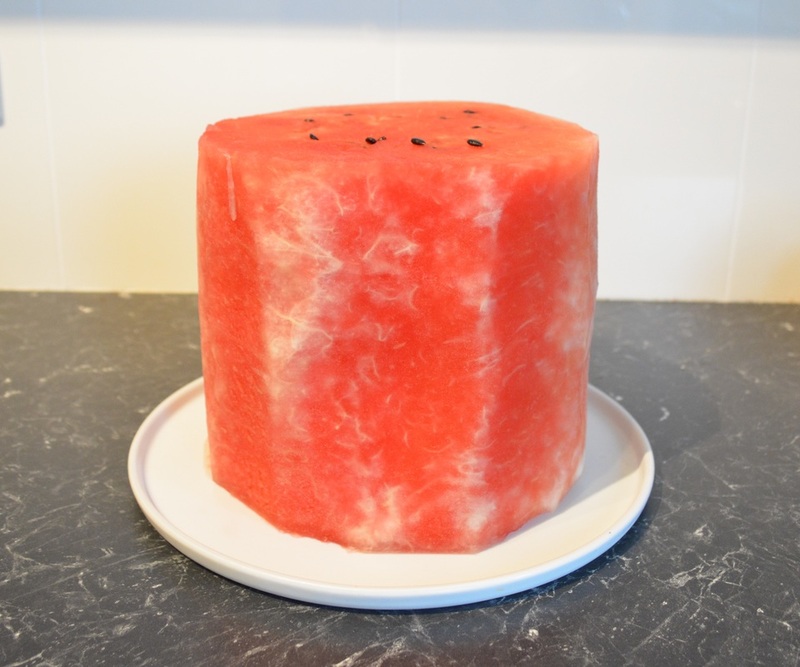 Also I decorated the cake with fresh berries, but you can make star shapes out of the offcuts of the watermelon and decorate it with watermelon stars. If you make the star shapes about 1 cm thick, they will stand upright. Now I did make other desserts that night, all were fruit based. I made a Two Fruits Trifle, a Pavlova and Pannacotta with Strawberry Champagne Jelly, so all my guests got dessert. But his birthday cake served two purposes, one he had something to blow candles from and two it was the fruit part of my evening. All the kids ate the berries off of the cake, then I sliced it up and everyone had a slice of 'cake' and some fruit all in one. A few notes: when whipping the cream, make sure it is to firm peaks, you need to time it so that it is as thick as can be before it goes too far and becomes butter. If the cream is too soft, it will slide down the watermelon. Even when it is whipped to firm peaks it will slide a little, but you can move it back and it will stay put. I put the cut watermelon uncovered in the refrigerator for at least 3 hours before icing it, to dry out a little. As it was my first time in trying to ice a watermelon I wasn't sure if the cream would stick to the watermelon. And once you have it iced place it in the refrigerator for at least 2 hours to 'set' the cream, then you can start decorating it. Once decorated place back in the refrigerator. The recipe also states 600ml thickened cream, buy an extra one just in case, you don't want to not have enough. If you don't need it, you can always use it for something else. 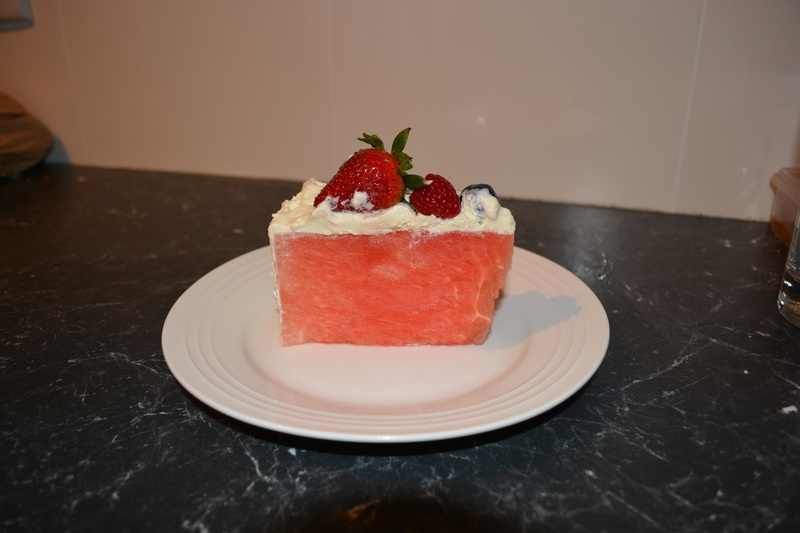 So if you have a kid like mine, give this watermelon 'cake' a go, it was a real crowd pleaser and with a little care and patience is very easy to make. Cut off the ends of the watermelon. You want to be left with a cylinder shape, how big you want it is up to you, you just want it to be even in size from top to bottom. Place upright on a chopping board and remove the rind carefully and any of the white part of the watermelon. Place on your serving plate. Place in the refrigerator uncovered for at least 3 hours. I do this to dry out the surface a little. Place the cream, sugar and vanilla in a medium sized mixing bowl. Beat with electric beaters until firm peaks form. Be very careful as if you take it too far, it will turn into butter and you will not be able to use it. Now starting from the top, place dessert spoonfuls of cream on the watermelon, and carefully spread it on the top. Then spoonful at a time, start working your way down the sides of the cake. The cream will want to slide down, but as it is thick, you can push it back up and it will stay where you want it, be patient. You only need enough cream to cover the watermelon. I did it in sections down the side, so where I started going down the side, I continued that line down, then started back at the top for the next section. 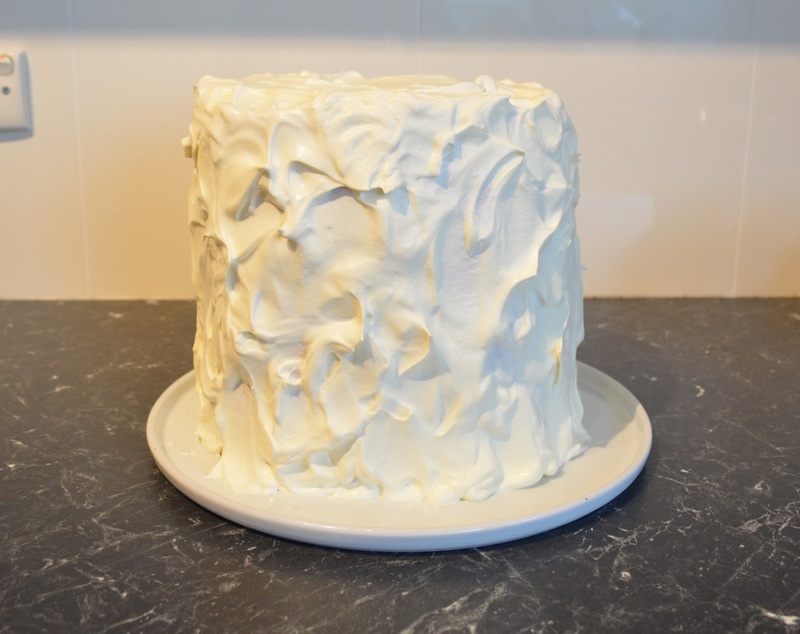 Once you have covered the entire cake, refrigerate for at least 4 hours to set the cream. I did not need to, but save any extra cream just incase you need to spot fix any cream that moved. When the cream has set, decorate the top and bottom with the assorted berries. If you are tempted to decorate the sides, I suggest using toothpicks to keep the fruit up as they will slide down.